Traditional belief based on scriptural details and astrological calculations gives the date of Krishna's birth, known as Janmashtami, as either 18 or 21 July 3228 BCE. Krishna belonged to the royal family of Mathura, and was the eighth son born to the princess Devaki, and her husband Vasudeva. Mathura was the capital of the Yadavas, to which Krishna's parents Vasudeva and Devaki belonged. The king Kamsa, Devaki's brother, had ascended the throne by imprisoning his father, King Ugrasena. Afraid of a prophecy that predicted his death at the hands of Devaki's eighth son, he had locked the couple into a prison cell. 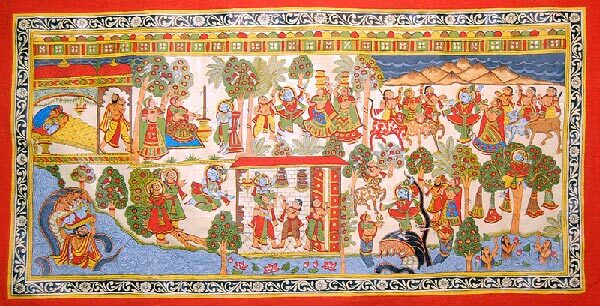 After Kamsa killed the first six children, and Devaki's apparent miscarriage of the seventh, being transferred to Rohini as Balarama, Krishna took birth. Since Vasudeva believed Krishna's life was in danger, Krishna was secretly taken out of the prison cell to be raised by his foster parents, Yasoda and Nanda in Gokula. Two of his other siblings also survived, Balarama (Devaki's seventh child, transferred to the womb of Rohini, Vasudeva's first wife) and Subhadra (daughter of Vasudeva and Rohini, born much later than Balarama and Krishna). According to Bhagavata Purana it is believed that Krishna was born without a sexual union, by "mental transmission" from the mind of Vasudeva into the womb of Devaki. Hindus believe that in that time, this type of union was possible for achieved beings. Nanda was the head of a community of cow-herders, and he settled in Vrindavana. The stories of Krishna's childhood and youth tell of his mischievous pranks as Makhan Chor (butter thief), his foiling of attempts to take his life, and his role as a protector of the people of Vrindavana. Krishna is said to have killed the demons like Putana, sent by Kamsa for Krishna's life. He tamed the serpent Kaliya, who previously poisoned the waters of Yamuna river, thus leading to the death of the cowherds. In Hindu art, Krishna is often depicted dancing on the multi-hooded serpent Kaliya. Krishna is believed to have lifted the Govardhana hill and taught Indra, the king of the devas and rain, a lesson to protect native people of Vrindavana from persecution by Indra and prevent the devastation of the pasture land of Govardhan. Indra had too much pride and was angry when Krishna advised the people of Vrindavana to take care of their animals and their environment that provide them with all their necessities, instead of Indra. In the view of some, the spiritual movement started by Krishna had something in it which went against the orthodox forms of worship of the Vedic gods such as Indra. On his return to Mathura as a young man, Krishna overthrew and killed his uncle, Kamsa, after avoiding several assassination attempts from Kamsa's followers. He reinstated Kamsa's father, Ugrasena, as the king of the Yadavas and became a leading prince at the court. During this period, he became a friend of Arjuna and the other Pandava princes of the Kuru kingdom, who were his cousins. Later, he took his Yadava subjects to the city of Dwaraka (in modern Gujarat) and established his own kingdom there. Krishna married Rukmini, the princess of Vidarbha, by abducting her from her wedding on her request. According to Srimad Bhagavatam, Krishna married with 16,108 wives, of which eight were chief—including Rukmini, Satyabhama, Jambavati; Krishna subsequently married 16,100 maidens who were being held in captivity by demon Narakasura, to save their honor. Krishna killed the demon and released them all. According to strict social custom of the time all of the captive women were degraded, and would be unable to marry, as they had been under the control of Narakasura, however Krishna married them to reinstate their status in the society. This wedding with 16100 abandoned daughters was more of a mass women rehabilitation. In Vaishnava traditions, Krishna's wives are believed to be forms of the goddess Lakshmi—consort of Vishnu, or special souls who attained this qualification after many lifetimes of austerity, while his primary queen Satyabhama, is an expansion of Radha. Once battle seemed inevitable, Krishna offered both sides the opportunity to choose between having either his army or simply himself alone, but on the condition that he personally would not raise any weapon. Arjuna, on behalf of the Pandavas, chose to have Krishna on their side, and Duryodhana, chief of the Kauravas, chose Krishna's army. At the time of the great battle, Krishna acted as Arjuna's charioteer, since it was a position that did not require the wielding of weapons. Upon arriving at the battlefield, and seeing that the enemies are his family, his grandfather, his cousins and loved ones, Arjuna becomes doubtful about fighting. Krishna then advises him about the battle, with the conversation soon extending into a discourse which was later compiled as the Bhagavad Gita. At a festival, a fight broke out between the Yadavas who exterminated each other. His elder brother Balarama then gave up his body using Yoga. Krishna retired into the forest and sat under a tree in meditation. While Vyasa's Mahābhārata says that Krishna ascended to heaven, Sarala's Mahabhārata narrates the story that a hunter mistook his partly visible left foot for a deer and shot an arrow wounding him mortally. According to Puranic sources, Krishna's disappearance marks the end of Dvapara Yuga and the start of Kali Yuga, which is dated to February 17/18, 3102 BC.